“Statistics are like bikinis. What they reveal is suggestive, but what they conceal is vital” American Professor Aaron Levenstien. This first graph is very interesting. In a very unscientific manner, I determined that agents become full-time when they sell over 6 properties in a year. It is fascinating to see that this graph represents a full 71.2% of the nearly 34,000 agents who fit into the category of “Part-timers”. Even more amazing was that a whopping 6136 agents, a full 18.6% of the Toronto Real Estate Board did not sell a property last year. 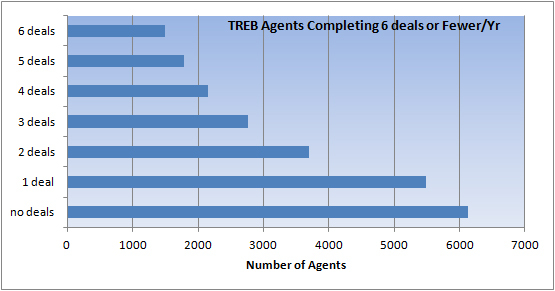 Note how the percentage of agents in each category diminishes as the number of deals an agent does increases. TREB membership has grown by over 1/3 in the last ten years and it seems clear to me that this segment of the membership will be particularly vulnerable to a downturn in our economy and if we were faced with as deep a recession as we saw in 1989, we could lose a significant number of agents. This next graph deals with full-time agents. What’s particularly interesting about this graph is the number of deals the top 1% do per year. At the very top of TREB are the group I have categorized as the “Super Ultra Agents”. This elite group consisting of only 7 agents represent a mere .02% of TREB. They almost exclusively work as team leaders and they sell over 200 units per year. The next group, the “Ultra Agents”, consists of just 39 agents or .12% of the total TREB membership. They also work as team leaders and sell between 100 and 200 properties a year. The next category is reserved for the “Super Agents” who sell between 50 and 100 properties per year. While there are nearly 150 agents in this category they represent only .45% of the membership. Finally, rounding up the top 1% are the 164 agents that are selling between 40 and 50 deals a year. The middle group, particularly the agents that are selling 7 to 12 units per year represent the most significant category. They are the biggest group of full-time agents, nearly 5300 agents or 16% of TREB membership. They are working hard enough to get nearly a sale a month, but with an average sale of $500k, this group is making a yearly income of between $87,000 and $150,000 before office split and expenses. Several months ago I produced an interesting Infographic on the Canadian Realtor, check it out here;http://bit.ly/w9UfpV . The research clearly illustrated that not only is the Toronto Real Estate Board the biggest board in Canada, it is over three times the size of the next biggest board, Vancouver. So why did we spend so much time doing the math? Simple, having an insight into the demographics of our board helps us to be better managers. These graphs are an amazing visual explanation on agent performance. I can see what the agents in our company are doing compared to the industry as a whole and I can work with agents to help them jump to the next category. What is clear is that at the very least, agents should be striving to hit the 7-12 transaction target as quickly as possible and as a dedicated manager it is my job to get them there. A few notes on the information gathered here. The statistics on agent performance are collected by a third-party, independently audited company called IMS Incorporated. When you see an agent claiming to be in the top 1%, it is almost always supported by IMS numbers. For the purposes of this post, the numbers provided only deal with units sold, not dollar volume, over the last calendar year. There is a small margin of error in some of my math. Don’t forget that there are a number of new agents that are working full-time but have yet to record a transaction. Also, the numbers do not report new construction sales. Great post, definitely an eye opener! What’s fascinating to me is the lack of basic math skills from the agents in the room. If TREB’s membership is 34000, then the top 1%is 340. How you measure them (units, dollars, etc) tells you *who* made the top 1%, but there’s always gonna be 340 of them. Guessing 3000 agents in the top 1% is saying TREB has 300,000 members… about the entire population of Markham. And that’s just the first respondent. The others thought more! Yikes!! Yes, you are correct in the math and I should probably edit the way it was written. The test was really meant as a visual demonstration to show agents “this tape measure represents all the agents at TREB and the first foot of it is the top 1%” and then talk about their production in terms of ends sold. Agreed. The insight is the productivity of that top 1%, not how many of them there are. Wow! I didn’t realize how many agents do less than 6 deals a year! Thanks for the valuable info! Hi Tiffany. Thanks for reading my blog. Glad you thought the info was useful. Have a great day. Does this post enlighten the public in the professionalism of our industry? Does this post suggest that the majority of REALTORs are part time housewives who find deals because they meet at the bus stop? Are commission discounters who do 75 transactions a year in the top 1% buy number of transactions but they charge $199 per end? While the figure for non selling agents are astounding; this could be retired, inactive, managers, banks, appraisers, moving companies who all have legitimate reasons for a membership. While many are struggling to provide a value added proposition; skilled in our craft with decades of experience, we are out stepped by part timers who will grab a deal a $500 or offer cash back on closing. What happens when the $1 to Co operating Broker becomes the norm? How will our industry cope with the VOW websites. Hi David, I appreciate your commentary. The numbers really do say a lot about our industry. Ultimately it speaks to the shear amount of agents in our market. Do we really need 34,000+ agents in Toronto? Have we let it get out of control? What separates good agents from the bad is the ability to work in a market that has too much product and not enough buyers. As for VOWs, I’m not sure what your stance is, however, I welcome them in as much as they will allow the public access to more information. From there, it will be important to get “offline” quickly, establish a relationship with a client and help them buy or sell a property. At the end of the day, our job is less about the keepers of the information and more about being a trusted advisor. Good agents and good brands are successful because they exude trust , integrity, knowledge. Hey Mark, thanks for this great story. These statistics are fascinating: where did you get the data from? Thanks Steven! Always happy to share! This is really good information. 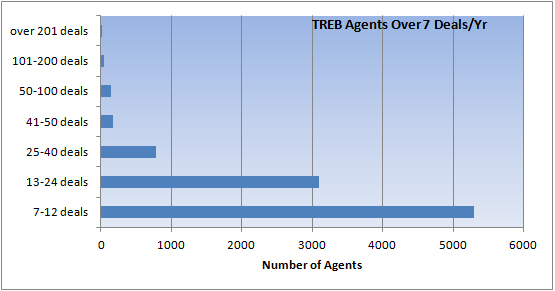 unfortunately there is very little statistical info on treb as to agent demographics. Would you happen to know who does have that info? Treb says they dont collect these stats. Sorry. I don’t think that info exists at TREB. I know that CREA has some deomographic info. I wrote a blog about it. Google The Anatomy of a Canadian Realtor and RealtyLaboratory. I can’t believe this is all there is. 35000 agents and not one bit of stat data.